Mary Pickford stars in one of her few surviving IMP films from 1911, a historical romance drama with intertitles composed of stanzas from a poem. 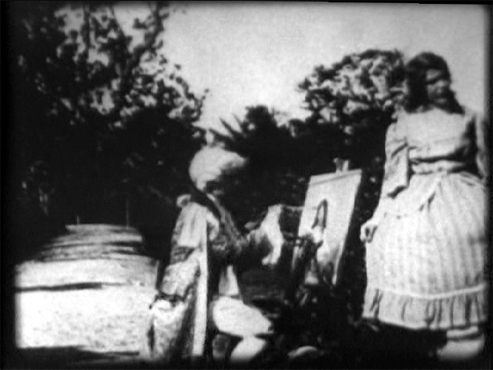 with Sweet Memories (1911), black & white, 12 minutes, not rated. Grapevine Video, no catalog number, UPC 8-48614-10050-5. One single-sided, single-layered, Region 0 NTSC DVD-R disc, 1.33:1 aspect ratio image in full-frame 4:3 (720 x 480 pixels) interlaced scan MPEG-2 format, 5 Mbps average video bit rate, 224 kbps audio bit rate, Dolby Digital 2.0 stereo sound, English language intertitles, no foreign language subtitles, no chapter stops; standard DVD keepcase, $14.95. Ratings (1-10): video: 3 / audio: 4 / additional content: 5 / overall: 4. This DVD-R edition has been mastered from a fair 16mm reduction print that is soft of image detail and contrasty, with deep, plugged-up shadows, which makes the actors almost unrecognizable. The film is presented with a music score performed on electric organ. This edition is hard to watch, with its blurry, dark picture. The film survives in 35mm nitrate prints in the Library of Congress; we hope that some day a quality home video edition can be mastered from those materials. This Region 0 NTSC DVD-R edition is available directly from GRAPEVINE VIDEO. 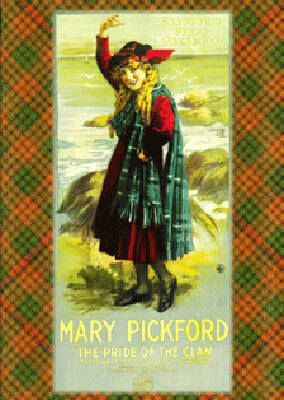 Other silent era MARY PICKFORD films available on home video.